For many educators across the country, this has been our first full year of adapting our instruction to meet the rigor of the new Common Core standards. One of the best pieces of advice I’ve received lately regarding planning under the new standards is a simple concept that can be a bit challenging to apply: think horizontally. 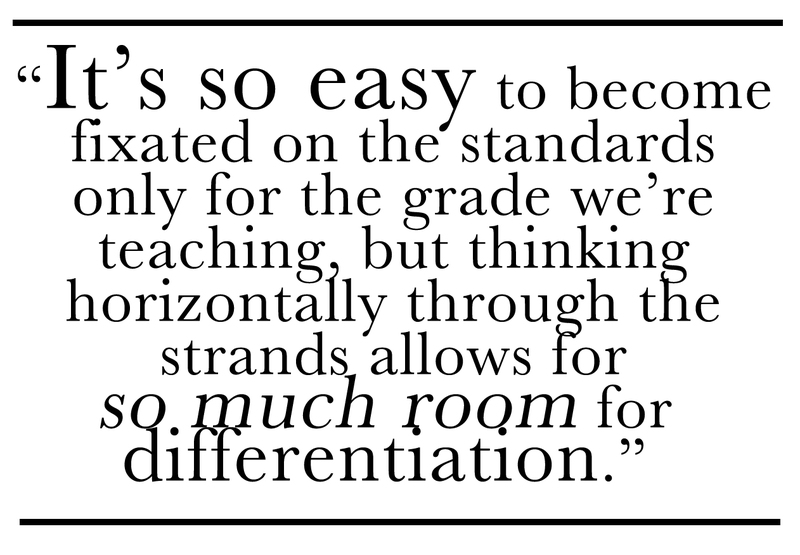 It’s so easy to become fixated on the standards *only* for the grade we’re teaching, but thinking horizontally through the strands allows for so much room for differentiation. Most students have only had the benefit of one year of instruction under the new standards, and may not have yet mastered the skills that the Common Core envisions as prerequisites. For example, the Common Core is written as if this year’s third grader has been receiving Common Core-level instruction since Kindergarten and has mastered all the standards leading up to third grade. Chances are, this hypothetical third grader probably hasn’t, and may need further instruction around some of the skills and strategies found in the standards. An effective way to fill in the gaps is to work horizontally through the standards using increasingly complex text. In Kindergarten, the strand reads: With prompting and support, describe the connection between two individuals, events, ideas, or pieces of information in a text. Describe how an apple seed becomes an apple tree sapling. (Refers to pages 2-3) What happened to the seed? How did it change? Why did the little girl plant the apple seed in a pot and not outside? How do you know? Use what you learned from the words and from the pictures to explain your answer. (Refers to pages 4-5) What happened to the little apple tree seedling? Why did the little girl bring the seedling outside? What is she going to do with the seedling? Why? How has the seedling changed since the beginning of the book? What season is it now? Is it the same season as it was at the beginning of the book? How do you know? Use what you learned from the words and from the pictures to explain your answer. In first grade, the strand reads: Describe the connection between two individuals, events, ideas, or pieces of information in a text. What do butterflies need to survive and to reproduce? (Literal) How do butterflies use plants to survive and reproduce? What is a “host plant”? How are host plants important to the butterfly life cycle? How do you know? Use what you learned in the text to support your answer. (Inferential) Think about one of the two key parts of the butterfly garden: the net covering. Why is the net there? What does it do for the butterflies? How do you know? Use what you learned in the text to support your answer. In second grade, the strand reads: Describe the connection between a series of historical events, scientific ideas or concepts, or steps in technical procedures in a text. Describe how Dawa’s house helps his family travel to find fresh grass and water for their animals. What is a ger? What does it look like? How do you know? Use what you learned in the text to support your answer. How is a ger built? What are its parts? What does each part do? What is it made out of? How is it built to be both strong and moveable? Why is it important that the house is strong and moveable? How do you know? Use what you learned in the text to support your answer. In third grade, the strand reads: Describe the relationship between a series of historical events, scientific ideas or concepts, or steps in technical procedures in a text, using language that pertains to time, sequence and cause and effect. Describe the festival of Naadam. What happens the day before? During the Naadam? During the closing ceremony? Retell each part of the festival in order, using evidence from the text to support your answer. Describe the parts of the ger and the customs and practices associated with each. Why is there an opening at the top of the ger? What function does it serve? What does the roof ring represent? How do Mongolians use their animals and surroundings in the construction of the ger? Use what you learned in the text to support your answer.